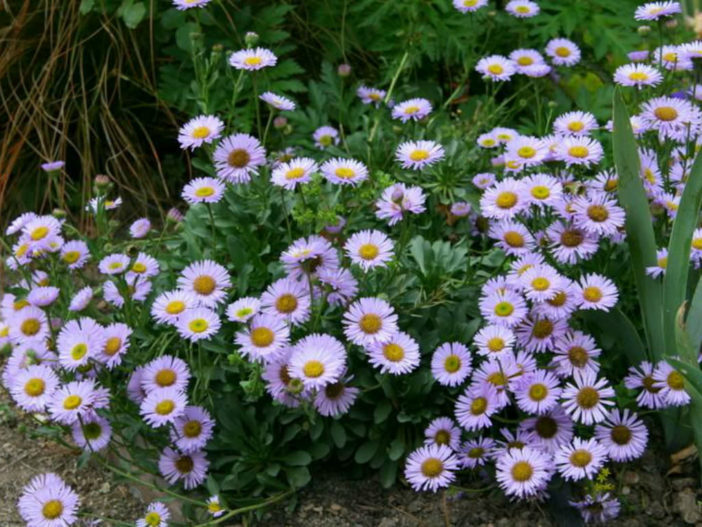 Erigeron glaucus, commonly known as Seaside Daisy, Beach Aster or Beach Daisy, are flowering perennials that grow wild along the Pacific Coast, from Oregon and Washington south to Southern California. This tough little plant is found in rugged environments such as coastal scrub and sand dunes. Seaside Daisies are low-growing plants that reach heights of up to 10 inches (25 cm), with a spread of up to 2 feet (60 cm). This evergreen perennial consists of glossy, grayish-green foliage. Attractive blooms with ice blue, daisy-like petals (sometimes with a lavender or pink tint) surrounding a large, bright yellow center. Seaside Daisy plants are durable, but they don’t tolerate extreme cold. This plant is suitable for growing in USDA plant hardiness zones 8 through 10. In mild climates, Seaside Daisies may bloom well into winter. Deadhead wilted blooms regularly to encourage continued blooming and to keep the plant tidy. Trim the plant down if it looks leggy in late summer. You’ll be rewarded with a rejuvenated plant and another flush of colorful blooms. Seaside Daisies are easily propagated by stem cuttings or by dividing the plants in early spring.